So December saw me finish the very final episode of Gilmore Girls and watch the first 2 episodes of A Year In The Life which is a netflix special. I cried my eyes out at the series finale and it was kinda ridiculous. 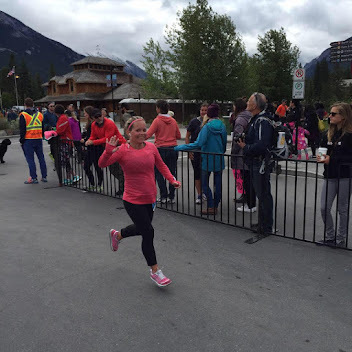 But having been raised by a single mom myself, I understood the pride and fantastic job that Lorelei did even though I was and still am not a huge fan of her. But I got it and I loved the ending so much. I was so excited to jump into A Year In The Life but seriously what a disappointment. One of my most favourite things about The Gilmore Girls and what I loved most was the emotional connection between you and every single episode you watched. Sure there were some episodes that were so dumb that I may have fast forwarded but overall, it was an emotional journey between Rory + Lorelei. And this Year In The Life was lacking that. 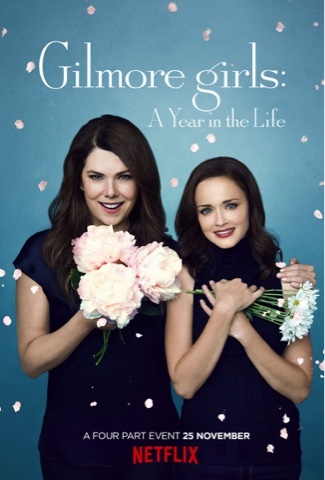 I felt no emotional connection at all to the show since it was so fast paced and Rory was flying back and forth between Stars Hollow and London. I was excited about one aspect of the special but disappointed when I found out the circumstances around it. I can't go into more detail incase Michelle reads this since she hasn't finished it yet. This month (January), I watched Episode 3 and ⅓ of Episode 4. I can't bring myself to watch the last hour of episode 4 because thanks to a photo shared on social media I know how this episode ends and it makes me so angry that they did this to her. This looks to be a hint that a second Year In The Life is going to take place and can't decide if this makes me happy or furthers my anger even more. After I got back from Saskatoon for Christmas I happened to be scrolling through the on demand movies on my Shaw Free Range App and saw this movie was on there. I had never seen it and had Carrie Fisher not died a few days earlier, I probably never would have noticed it was on there. I had no idea that this was written by Carrie Fisher and was semi-biographical on her life. But to be honest, I had no idea who Carrie Fisher even was until last year when she was age-shamed on social media based on her appearance in that Star Wars movie. I know, I know. I mean, I knew who Princess Leia was but didn't know who played her. But why would I? I enjoy Star Wars about as much as breaking a leg. But after seeing this movie and reading the stuff I did about her and her mom, I totally saw that in this movie. 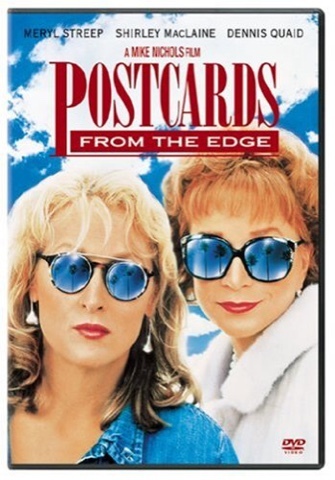 I really enjoyed this movie and I loved the sunglasses that Shirley Maclaine wore when bringing Meryl Streep home from rehab. Like seriously, where can i find those??? The last movie I watched in 2016 was that of "The Other People". It was written and directed by Chris Kelly, who is co-headwriter this season on Saturday Night Live. This was also based on Kelly's life and absolutely phenomenal. I absolutely loved this movie and it is available for you to watch on Netflix and really you should go watch it. 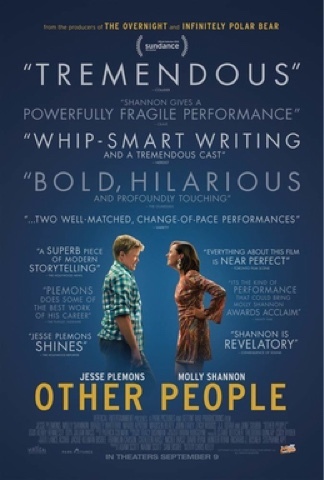 Molly Shannon was amazing in this movie and how she doesn't win all the awards for it, I will never understand. This movie tugs at all the heart strings and gives you all the feels. You can thank me later.